The Cafe Sahara building is located on the edge of Chinatown near the 880 North/980 East entrance. 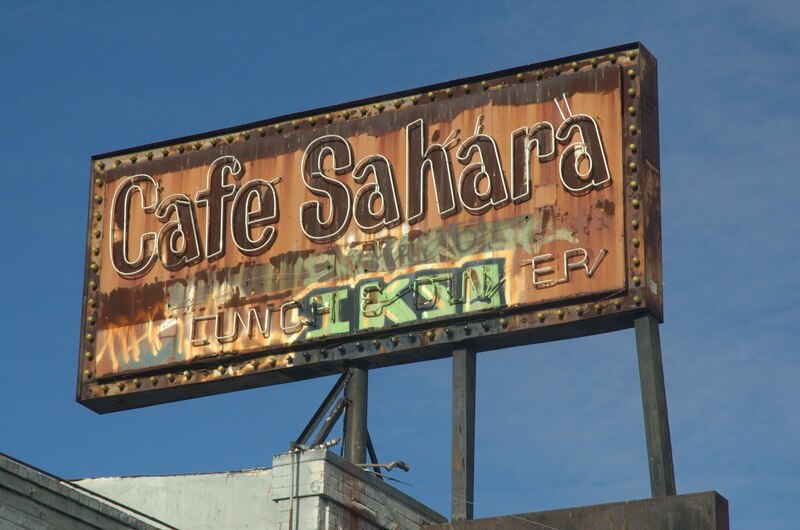 Its prominent neon sign -- "Cafe Sahara lunch & dinner" -- makes it a popular subject for photography. The location has a rich history, although little is known about the eponymous Cafe Sahara itself. In 2004, the building caught fire, and it was discovered that the tenants were growing $200,000 worth of marijuana plants. The owner said that prior to the fire, the building had been used as a practice space for bands. 2 This could refer to it's time as Jackson Street Studios. photo from Our OaklandThe building's construction date is 1913, according to the parcel information available through the City of Oakland interactive Planning and Zoning map. The building's official address is 609 Jackson Street. The building is in the Local Historic Property category "Local Register or Potential Designated Historic Property" and has an area of 9.977.03 square feet. 4 Mentioned in Oakland Tribune on Thursday, December 18, 1941.